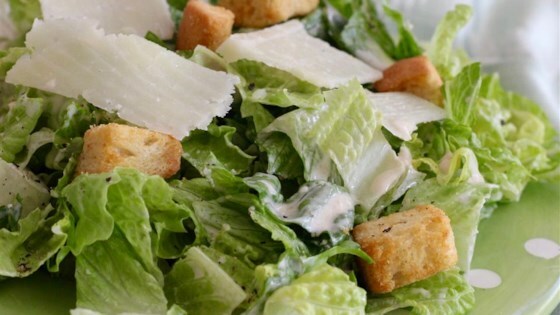 "This is an unbelievable, restaurant-quality, creamy Caesar salad dressing that will make you swear off of anything store-bought again. Great for your classic Caesar salad, or as a dip for all kinds of veggies. Will NOT disappoint! To serve, toss with chopped romaine in a salad bowl and shave Parmesan cheese on top of salad; season with salt, black pepper, and a squeeze of fresh lemon juice." For a lowfat version, substitute light mayo and lowfat milk for regular mayo and half-and-half. This is the first recipe that had good reviews on this site that was really bad for me. This is way too much mayonnaise. The dressing smells and tastes like fish flavored mayonnaise.